In a New York Times story published ahead of today’s Packers-Cowboys NFC Divisional playoff game, Aaron Rodgers’s father confirms he and his son are not on speaking terms, and appears to blame the rift on Rodgers’s fame. The quarterback’s estrangement from his family was first revealed when his brother Jordan was on The Bachelorette. 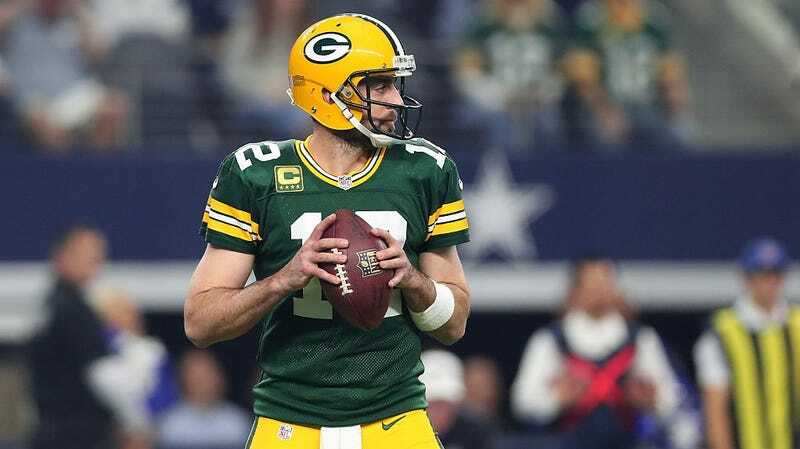 More details came to light in a Bleacher Report profile that said Rodgers has gone so far as to mailing back Christmas gifts from his parents in December 2014. The circumstances in which the family’s private business became a national story were “weird,” Ed Rodgers acknowledged. “Airing public laundry is not what I would have chosen,” he added. But he said he was not upset that it had happened. “It’s good to have it all come out,” he said. Rodgers’s relationship with his family adds a new layer to his public image, one that includes his D1 snub out of high school, his otherworldly talent and single Super Bowl victory, and his relationship with Olivia Munn over the last couple years. But his refusal to talk about his relationship with his family means that it’s his family’s version of events that becomes public, not his. None of us on the outside have any real idea about what’s going on with the Rodgers family, but it’s a safe bet that Rodgers and his father have differing perspectives on their estrangement.